Pictured above are Tillandsia setacae growing on the way to the Boathouse at the Florida Medical Entomology Laboratory. 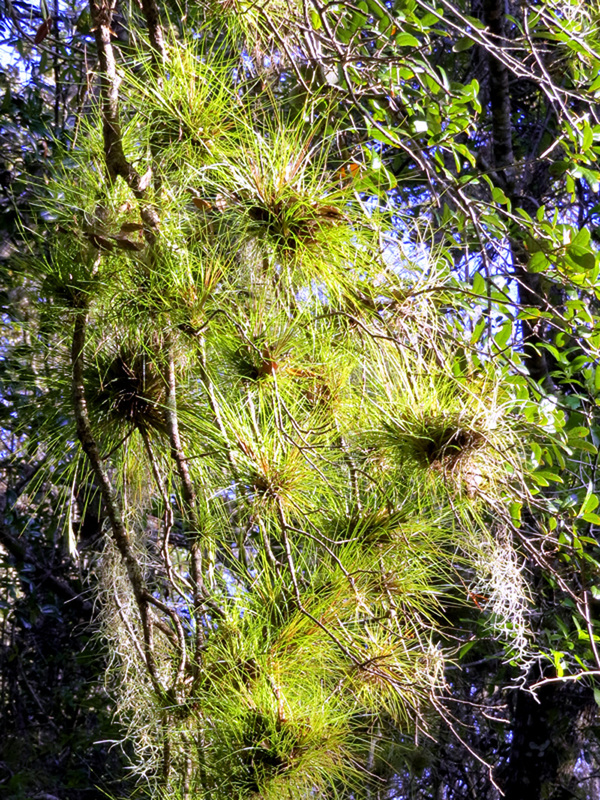 This epiphyte goes by many common names including Southern needleleaf, needleleaf airplane, and quill-leaved wild pine. Its genus name, Tillandsia honors 17th century Swedish botanist Elias Tilands who reportedly is known for his fear of water bodies. Southern needleleaf grows without much water. Its species name, setacea, means bristly. The term setae is used in mosquito morphology to describe bristly hairs. This term is used in a wonderful pictorial publication by Dr. George O’Meara that will allow you to identify mosquito larvae. Some bromeliads in this genus known as “tank” bromeliads hold a bit of water, enough water for mosquitoes to breed especially the bromeliad-specialist mosquitoes in the genus Wyeomyia.